Seriously, though, let’s never speak of the weather again. Am I cynical? Probably. Mostly, I’m just bored with seeing the same themes and phrases pop up over and over on food blogs across the nation. It’s Fall, and it’s happening to everyone. We get it. Talk about the food already. My corner market had some “homegrown” cauliflower, and I had no reason to doubt the claim because the leaves were still on the heads. I’m talking huge heads of cauliflower, with all the leaves. The two of us ate one head for an entire week, no joke. 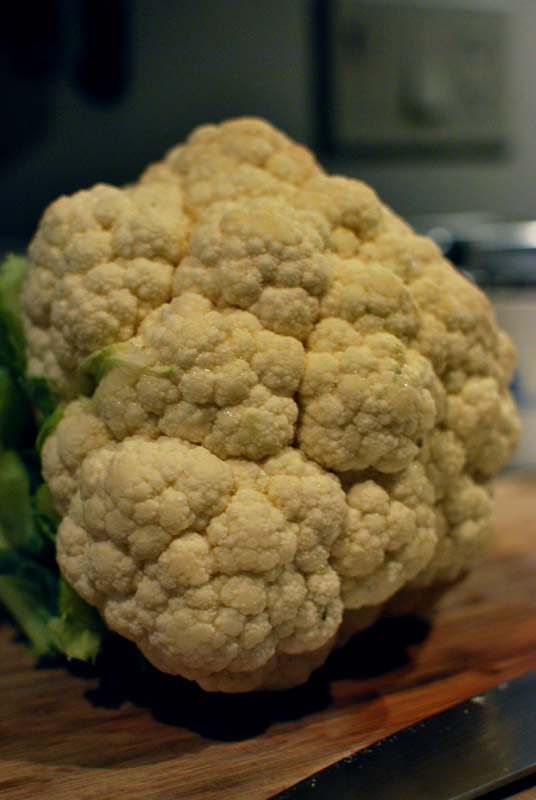 So, oh my god, what does one do with cauliflower when one has had it nine hundred ways already, and even saved the leaves because they’re edible and one can’t bear to throw out anything edible? The answer is always soup. Clean out the freezer, find that amazing sausage that your Old Kentucky Grandmother sent you, and the crawfish tails that you really should’ve used by now. Let it all simmer on the stove until your eyes fall out from using the computer too much. Soup! 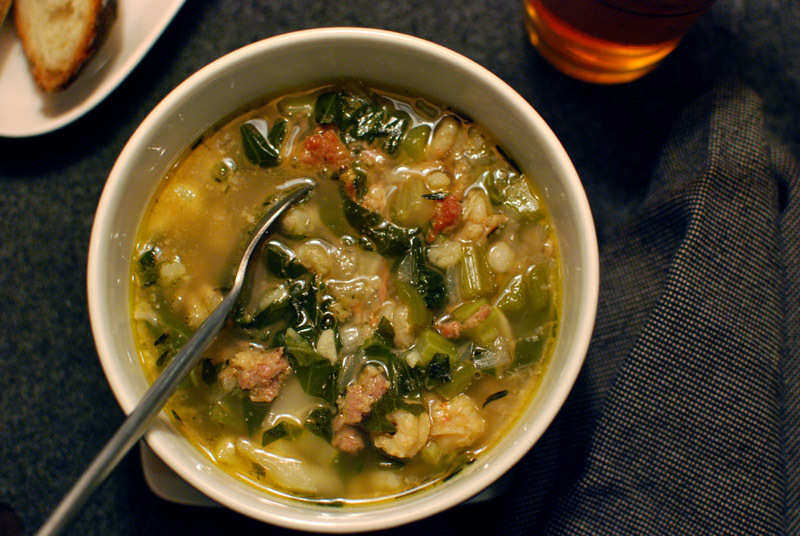 Serve this with beer and the requisite crusty bread. And ignore what’s happening outside. For the sausage, I used some incredible breakfast-type sausage that my grandmother sent me. I think just about any kind would work here, as long as it would go well with crawfish. Or heck, omit the crawfish and use whatever sausage you darn well please. My cauliflower was of the homegrown sort, so it had a ton of leaves still on it. If yours doesn't have any leaves, don't sweat it. Omit it, or use some other hardy green like chard or kale instead. 1. In a large pot over medium heat, cook the sausage until browned. If there isn't much fat that has rendered out, add a splash of olive oil or a knob of butter. You should have a tablespoon or two of fat in the bottom of the pot. 2. Stir in the onion, celery, and bell pepper. Sprinkle with a pinch of salt, and cook until just translucent, 10 to 15 minutes, stirring occasionally. 3. Add the garlic, bay leaves, cayenne, thyme, and a few grinds of pepper. Cook for 3 to 5 minutes, or until fragrant, stirring occasionally. 4. Add the stock (or water), increase the heat to high, and bring to a boil. 5. Optional step: if you have the leaves from your cauliflower, strip the center ribs out (leave them on the smaller, more tender leaves), and slice the leaves crosswise into very thin ribbons. If using chard or another green, you can leave the center ribs in; slice crosswise into very thin ribbons. Add to the pot. 6. Stir in the cauliflower, and return to a boil. Lower the heat to maintain a simmer, and cook for 20 to 30 minutes. 7. Add the crawfish, and simmer for another minute or two, just enough to warm them without overcooking. 8. Serve hot with plenty of crusty bread.